” Curivari cigars are made with 100% Cuban seed Nicaraguan tobacco. We blend for a classic Cuban flavor profile that we enjoy, not with focus on strength, but more looking for flavor and aroma in a right balance. All cigars are finished with a triple cap”. Lets go to the cigar it self. 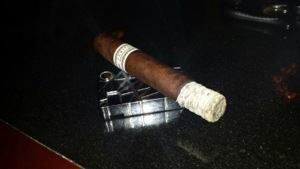 A very nice looking cigar, smooth oily dark wrapper with very soft veins, flawless construction and perfect draw. The pre light draw was cool with mild cocoa and leather aromas. Starts off very mild and creamy with sweet tobacco taste, and that last for quarter of an inch when the cigar start to open up. Loads of thick smoke coming with each puff, it’s still balanced in strength but has a lot of flavors Rich earthy peppery coffee with hints of cocoa & caramel “what would be expected from a Nicaraguan Puro”. The 1st half wands with a very flavorful profile, the pepper is upper and the body is medium-full with a predominant floral sweet woody flavor. The final part have balanced it all, the body & flavors, the woodenness, sweetness, earthiness, coffee & pepper are equal while some leather taste appeared in the background. I found my experience with the toro size very similar to yours. It’s an excellent smoke, and I will have to track down more, as well as try some of their other lines.